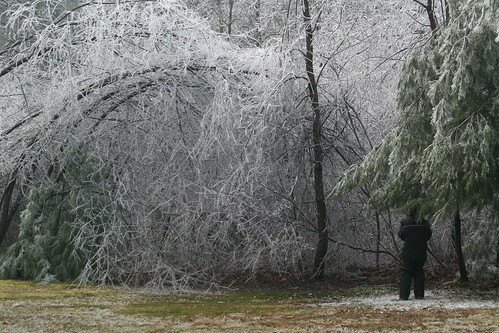 Here in New England we suffered a massive ice storm which left half a million people without power. We were fortunate to regain power after nine hours on Friday, but many of our neighbors and surrounding areas are still in the dark this weekend. It started on Thursday when the public school emergency announcement system called in the morning to declare early release for the students in anticipation of the storm. It rained steadily all Thursday, but temperatures stayed above freezing. When I went to leave work at 6 pm, my car was encased in ice. I hadn't put my ice scraper into the car yet, so I waited in the parking lot while my windshield washer and defroster melted the ice. That night, we woke every few hours when we heard cracks from the trees outside and we worried about the house. We lost power briefly but it came back. Then we heard something hit our roof. It wasn't loud enough to sound like any damage was done, but Doug and I were both awakened by the sound. A few minutes later, the phone rang. It was 4:30 am. I knew it had to be the school announcement system telling us that there would be no school, but Doug felt that could be important and we should answer it. Since the phone was on my side of the bed, I ignored it. The answering machine picked up and sure enough, it was the automated announcement. They really ought to enforce more reasonable hours for calling! I woke up on Friday morning when Doug's alarm clock went off. He usually uses the radio but this time the buzzer was going off. We quickly realized that the power was off, and that this incredibly smart radio was using the backup battery to buzz the alarm at the correct time. How cool is that! And what wondrous device is this? The Bose Wave Radio, a hand-me-down from my mom. 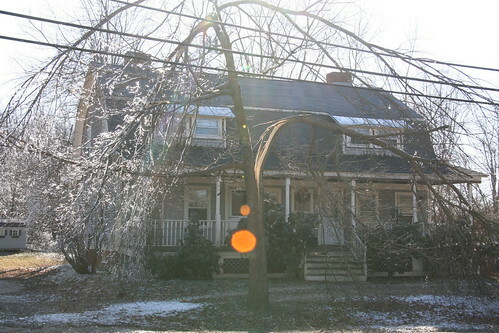 We looked outside and thankfully saw that no large branches hit the house. I tried to call my work on my cell phone to see if they were open, but all the extensions gave back a busy tone. The main number just rang and rang and the usual message never came on. I figured that they had no power, so I decided not to go to work. We have Vonage for our landline, so no power = no internet = no phone. Thank goodness for automatic forwarding and my iPhone for phone and internet access. We got our wood stove going for heat and listened to the radio. There was not much news about the storm, so we just took it easy and spent time doing things around the house. I finally took out the Christmas tree for the kids to decorate and I stamped and sealed all our holiday cards. We had cold sandwiches for lunch, read Harry Potter out loud and I even took a nap. In our yard, we lost one small cherry tree and had damaged pines along our road. Quite a few birch trees were bent all the way over and touched the ground (above). 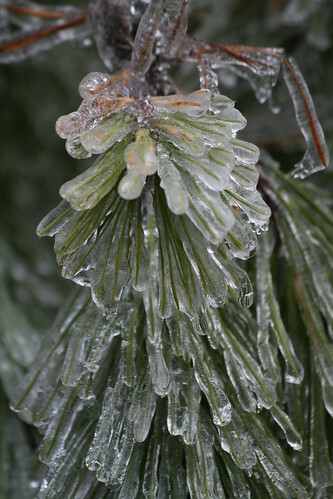 Doug cleared the pines away while I took pictures and Adam had fun knocking ice off the trees. 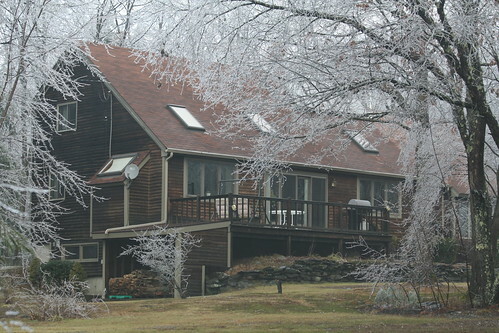 Our house looked beautiful with all the iced trees around it (first picture), and we were extremely grateful that we sustained no damage other than power loss. We regained power at 3 pm, and things were back to normal. On Saturday, I tried to take the kids to my company's Children's Christmas Party off site, only to find it canceled. Along the way, we saw the extent of the damage. Many trees that were blocking the road had been cut and dragged to the side of the road. This tree was split right in half in my town. We went grocery shopping and came back to learn that one of Dova's friends who lives only a couple miles away was still out of power. We invited her to sleepover, gave them both warm baths and made a dire situation fun for the kids. 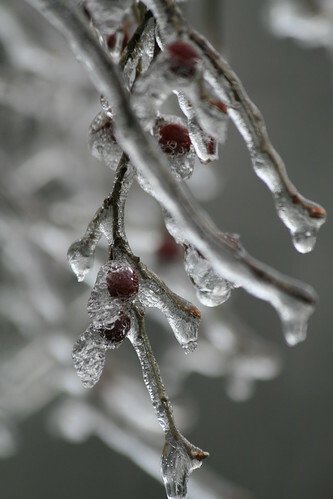 The most insidious thing about an ice storm is that once the ice is melted off the trees, there isn't anything to show for all the damage. There isn't two feet of snow left behind, it looks all so normal except for some crushed ice under the trees. We got one last call from the emergency announcement system saying that two middle schools in our area were open as shelter with both food and cots. Since it is 15F as I write this, I am grateful that there are places for my neighbors with no power to go. The next issue after a prolonged power loss in the wintertime is burst pipes. Wood stoves and fireplaces may keep some rooms of a house warm, but probably not enough to prevent all the pipes from freezing in these temperatures. Hopefully, power will be restored soon to our neighborhood and surrounding areas. Please keep them in your thoughts and prayers.